Our company has national representation and our qualified team of staff provide a complete service, from a free measure and quote through to design, consultancy, installation and maintenance. Our products are installed in a diverse range of environments such as; domestic, retail and commercial applications and are supported by a suitably experienced service team. Dealing direct with the manufacturer eliminates the middle man and all service requirements within or outside warranty periods are given the same amount of importance and dealt with promptly. 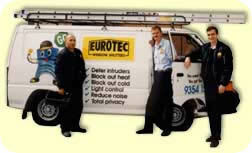 Our service department can be contacted on 03 9354 1500, 24 hours a day, 7 days a week.